We have detailed many of the new features of the new MacBook Air and Mac mini lines today, but many of you have been asking for some detailed charts that compare the new models to the previous generation models. 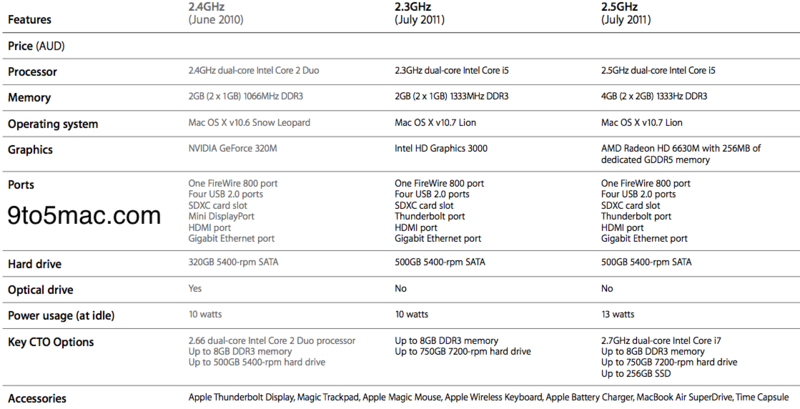 Now we have obtained Apple’s internal comparison charts for your perusal. Above, you will find the chart that compares the new 11.6 inch MacBook Air with the old one and after the break you will find an identically styled chart for the 13 inch MacBook Air, Mac minis, and Mac mini servers.